We've written plenty of times about the chilling effects of abusing the legal system to silence critics. Most commonly, we highlight bogus defamation cases -- as that seems to be the favored choice of those trying to shut someone up. Sometimes we've talked about abusing copyright law to silence people as well. But there are other mechanisms to use, and today we'll be highlighting a local political fight in California that resulted in someone getting a "temporary restraining order" on a critic which was clearly little more than an attempt to silence that critic from calling attention to factual information in the past. The story involves two individuals who were engaged in local politics in Santa Clarita, California. One is a guy named Sean Weber, who sought an open City Council seat earlier this year. 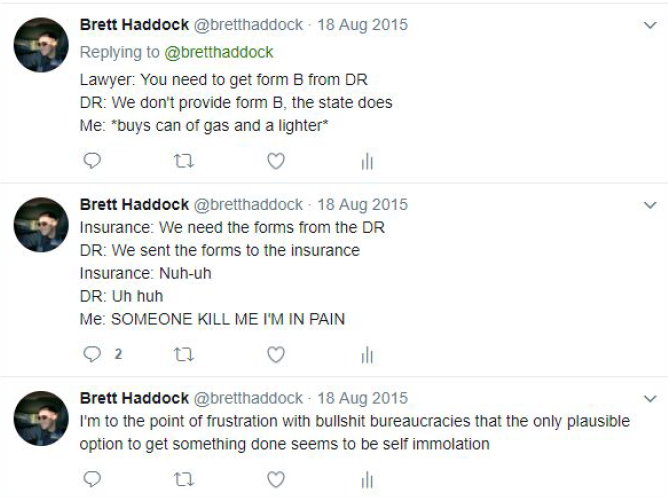 The other is a guy named Brett Haddock, who also initially sought the same open City Council seat... and also happens to run a very amusing satirical Twitter account, @NSA_PR in which (you guessed it), he channels the satiric id of the NSA's public relations team. (Full disclosure: I've interacted with that Twitter account a bunch online, and I believe that Haddock has purchased some of our t-shirts and backed some of our crowdfunding campaigns, though I haven't gone back to check -- so feel free to read this story with all of that in mind). Neither Weber nor Haddock obtained the open seat. Either way, Haddock and Weber did not see eye to eye on things. The full nature of the dispute isn't all that important, but for one key aspect. In running for City Council, during a radio interview, Weber made two key claims that Haddock felt were misleading. The first was that he volunteered at a local homeless shelter and the second was that he had been working with a local school district on an "active shooter" response system. Haddock, in response, posted a blog post detailing why both of these points were misleading. There are lots of details in Haddock's post, but the very quick summary is that the "volunteering" at a local homeless shelter was actually 192 hours of mandatory community service as part of his probation after being arrested for "dissuading a witness by force or threat." So, yeah. He worked at a homeless shelter, but it's a bit rich to hold that upt as "volunteering." As for the "active shooter" stuff, Haddock points out that it appears that Weber, as part of his job running a "managed service provider," approached the school about selling them on some communications services that might be useful in emergencies. In an email that Haddock obtained from school district officials, it was noted that Weber "cold called" them in trying to sell them some services and the school met with him a few times, and were told that Weber would submit a proposal, which the official does not believe ever came. Whether or not you consider Weber's claims in a radio interview to have met with the school to discuss such a system or to "provide guidance" on such a system to be accurate or not is a matter of your opinion. It certainly does seem that the fact that this was as a sales cold call provides some useful additional context that Weber was less than clear on. If you've engaged in internet fights, it's not all that different than probably tons you've seen before. That all came a few weeks before Haddock's blog post described above. Immediately after that blog post, Weber filed for a restraining order. That... doesn't make much sense. All there had been was some heated online discussions and a blog post that was clearly protected speech. 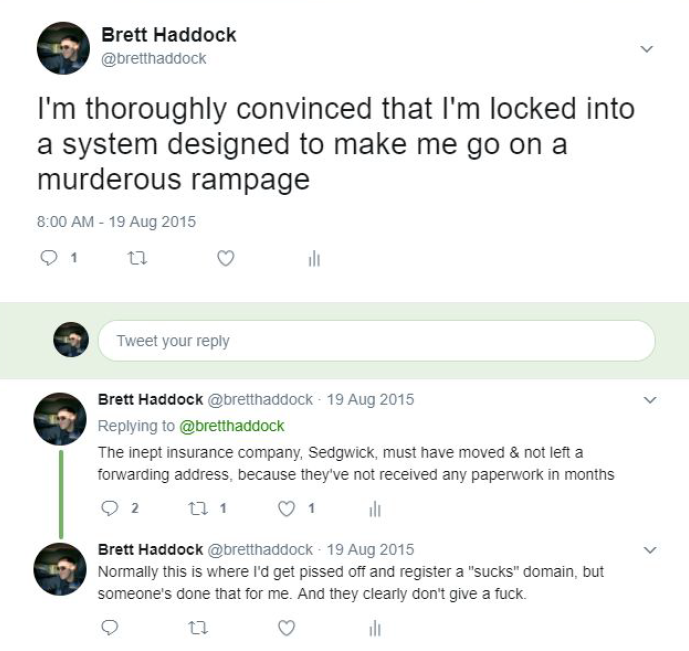 Yet, in the paperwork for the restraining order, Weber's lawyer said that Haddock had engaged in "a persistent pattern of online 'cyber' harassment that has been increasing in volume and a harassing course of action, including but not limited to posting of the private home address and telephone numbers." It also claims that "the tone and volume of the messages have increased to the point where Petitioner is fearful for his safety and that of his family." As you look through the details most of this is not at all true. It does appear that they had that conversation on Facebook a few weeks earlier, but after that all conversation ceased. The issue of posting "home address and telephone numbers" was apparently a missed redaction in some of the court documents that Haddock posted as evidence. A family member of Weber's asked Haddock to fix and Haddock noted that he had redacted the info and asked politely if any information that should have been redacted had been missed... and never heard back. Weber's restraining order request claims that Haddock ignored the requests which does not appear to be true. Even more ridiculous, Weber and his lawyer present a worker's comp situation that Haddock is engaged with concerning his current employer as evidence that Haddock has psychological problems. That's based on part of the worker's comp claim where Haddock's claim noted he has been having difficulty sleeping due to a back injury after his office chair broke. Finally, after Haddock and his lawyer responded, pointing all this out, rather than prove the supposed increasing cyber harassment, Weber's lawyer filed a truly bizarre response, that is the legal equivalent of "look, squirrel!" Rather than showing the supposed cyber harassment, the brief completely pivots and mostly focuses on combing through Haddock's social media feeds and taking random tweets (usually joke tweets) completely out of context to suggest that Haddock is somehow mentally unstable and therefore dangerous. When put back into context it's quite clear that nothing of the sort is true. 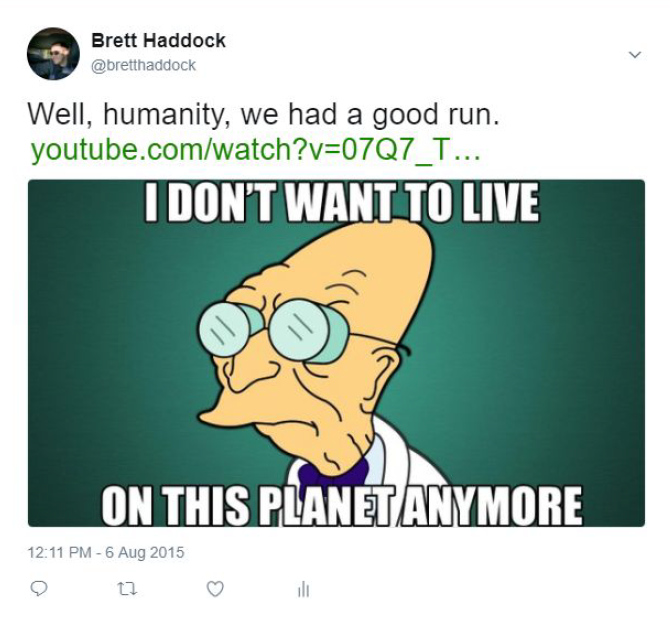 Beyond the fact that this is from two years ago (well before this dispute happened) and beyond the fact that it's just a general exasperated statement using a Futurama meme, Weber's lawyer ignores that YouTube link. What is it? It's a twerking stuffed dog. Haddock isn't suggesting that he's going to kill himself or do damage. He's mocking the fact that a twerking stuffed dog is the end of civilization. How that could possibly be evidence of either mental instability or "harassment" requiring a restraining order is beyond me. Over and over again, the tweets being used as evidence against Haddock are merely jokes or wry commentary on totally unrelated issues (bizarrely, a few of the tweets actually involve a wholly unrelated issue loosely involving Techdirt and someone who was very angry at one of our own stories). This is all... pretty terrible. And, it gets worse: the court granted the restraining order. At the last minute, Haddock brought in Ken "Popehat" White to handle the hearing, and White got the judge to say that Haddock can still blog about Weber, but there's now a two year restraining order on Haddock saying that he needs to remain physically separate from Weber, keeping a distance of at least 100 yards in most cases, reduced to 20 yards at public gatherings. Haddock and White have both made it clear that they are going to appeal this restraining order, which Haddock has argued effectively makes it impossible for him to engage in local political issues, as he's done for years. The whole thing appears to be a clear attempt to stifle free speech through legal process. It's difficult to see anything that Haddock has done that reaches a level of harassment or "stalking" that requires a temporary restraining order, and because of that his own speech is at the very least chilled. Re: Re: Completely normal politician then? But I would generalize his statement a bit: this kind of behavior is typical of most elected officials today... and quite a few appointees as well.